Music-lovers wailed and a fat lady probably sang when Union Square bar Tir na nOg closed in early 2007, after establishing itself as a destination for "roots" music with a country, blues, or traditional stamp. Patrons haven't forgotten the bar. "It was the best place ever," said Meaghan Murphy, 28, of Somerville. 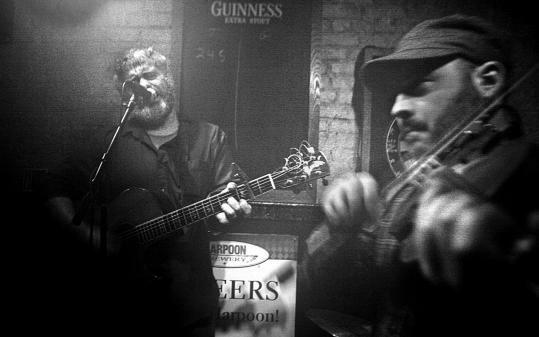 Regulars in the dark, subway-car-sized bar included blues guitarist David Johnston, rock crooner Dennis Brennan, Irish/rasta Ronan "Fluffy" Quinn, folk/bluegrass mandolinist Sean Staples, and nOg co-owner Robert Elliott's Irish rock group, the Johnny Come Latelies - all for free. But fears of the scene's demise turned out to be all wrong. Two years later, roots music is doing better than ever. Three scions sprang up in the nOg's wake: Precinct, Sally O'Brien's, and - recently opened in the old bar's Somerville Avenue location - Bull McCabe's. "Union Square kept it going," said Diane Roderick, 48, of Somerville, at Sally's with her husband, Jimmy, 51, and several bottles of beer. Despite the similarities in the music, everyone interviewed that night thought the rising tide floated all boats. "The more business in the square, the better it is for everyone," said Bull McCabe co-owner Brian Manning. "We view it all as a community - just bringing people to the area," said Sammarco, who used to play at the nOg. Some people got up and danced during his band's twangy set; a few opted for ultimate fighting on the bar TV. Many people out that night frequented more than one bar and saw subtle differences between the venues. Murphy pointed out a Sally's bartender at Bull McCabe's. Sally's has "its own little style to it. More of a country feel," Elliott said. Bull McCabe's patron Derek Denny of Somerville, 27, thought Precinct had a more formal atmosphere and a wider variety of music - both genre and quality. The basement-level bar is heavy on dark wood and drapery. Bull's "is definitely the most homey," he said. Murphy, also at Bull McCabe's, agreed. Going to Precinct is "more of an event," she said, and the music was "kind of hit and miss." However, Roderick thought the Precinct got people loosened up. "I'll say to my husband, 'I'll come home in a little while,' " she said, "And I don't come home in a little while!" But, despite starting out at a sports bar in Cambridge and never having set foot in the nOg, he's trying to build on the room's reputation. He repainted the walls and changed the books on the shelves but kept the old bar and tables - and many of the bands. In fact, he has called on Elliott for informal help. "I've fallen in love with the music more than I was expecting," Manning said. Denny was "apprehensive at first . . . I didn't think it would be able to hold the same atmosphere," he said. "But it's succeeded." And the Elliott stamp of approval was worth its weight in gold. Despite no longer owning a bar, he has remained the king of roots music in Union Square. Denny said, "You know Robert, right? Robert brings a lot in and he's supporting this place and he's supporting Precinct." He added, "His support in this neighborhood is next to nobody." The music kingpin himself took the stage at midnight for an Irish/rock jam with Quinn's band. Patrons hollered out the refrain. If you squinted your eyes it could be five years ago, with a different name on the door.